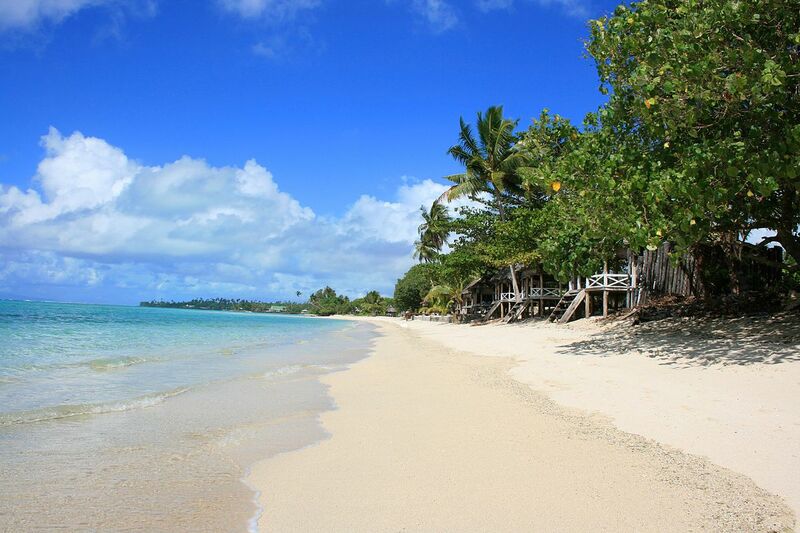 Most of us, when we think of vacations, we imagine the beach, the sea, the sun..and sand. The Sand wars by Denis Delestrac : Sand is more than just beaches and holidays. Image from the internet. What most people don’t realize is that sand plays an important role in our daily lives – not just when we’re on vacation. The Sand Wars by Denis Delestrec : Mortar. 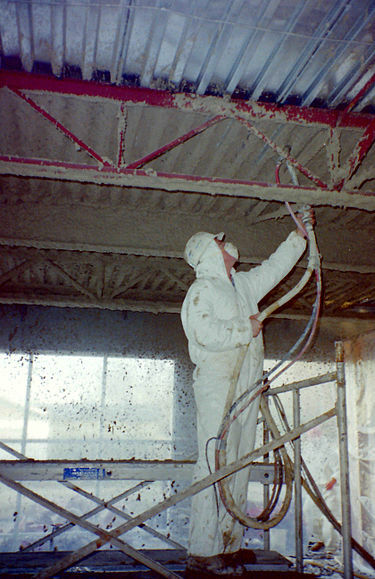 Image from Wo Are Builder Supply. The Sand Wars by Denis Delestrec : Sand is used in making cement. Image from The ‘Word Thoughts’ Blog. 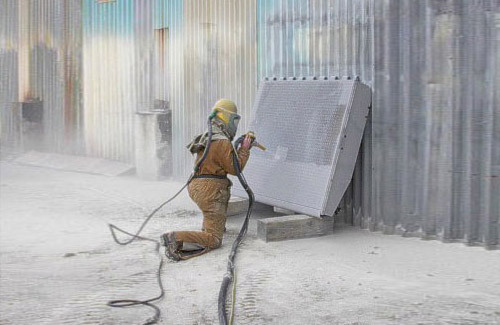 The Sand Wars by Denis Delestrec : Using sand for plaster. Image from the internet. Sand wars by Denis Delestrac : Our houses possible, thanks to sand. Image from the internet. and the buildings where we work.It is used in airports, hospitals, schools, pavements, roads and yes, you guessed it- even artificial islands. The Sand Wars by Denis Delestrac : The Palm Islands, made of sand. Image from Wikipedia. 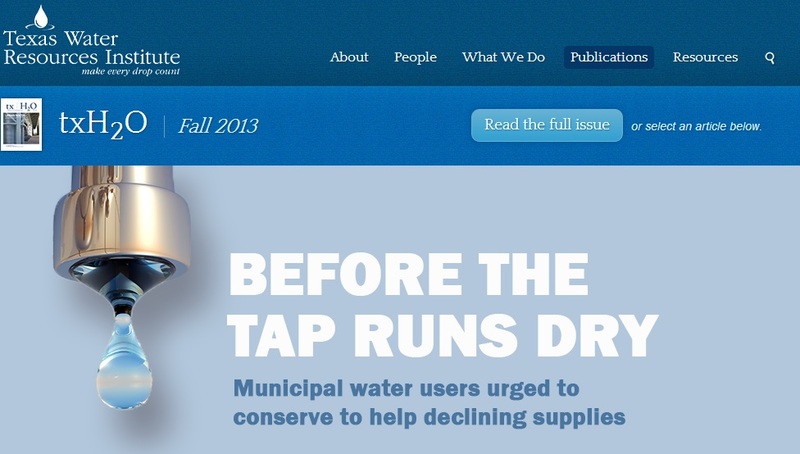 At home, it can even be used to filter water. Haven’t you ever stopped to marvel at the uses of sand? Surely, it deserves our attention-and not just when we’re lounging on the beach in our bikinis. When we go to the beach, we see an abundance of sand, it’s hard to imagine that it can actually run out. Well, I have news for you : we are running out of sand. 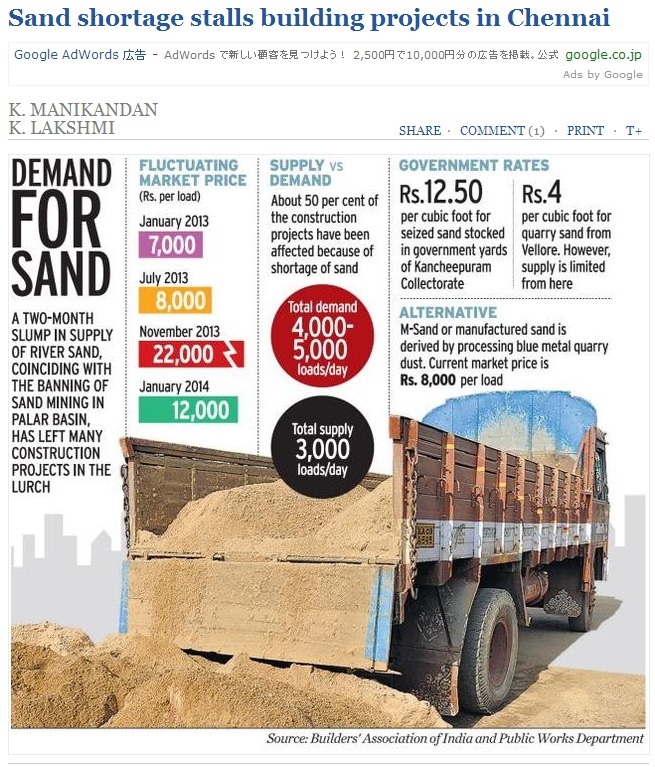 The Sand Wars by Denis Delestrec : Sand shortage stalls building projects in Chennai by the Hindu. Image from the Hindu. Inadequate supply of river sand has hit construction activity in the city over the past two months. 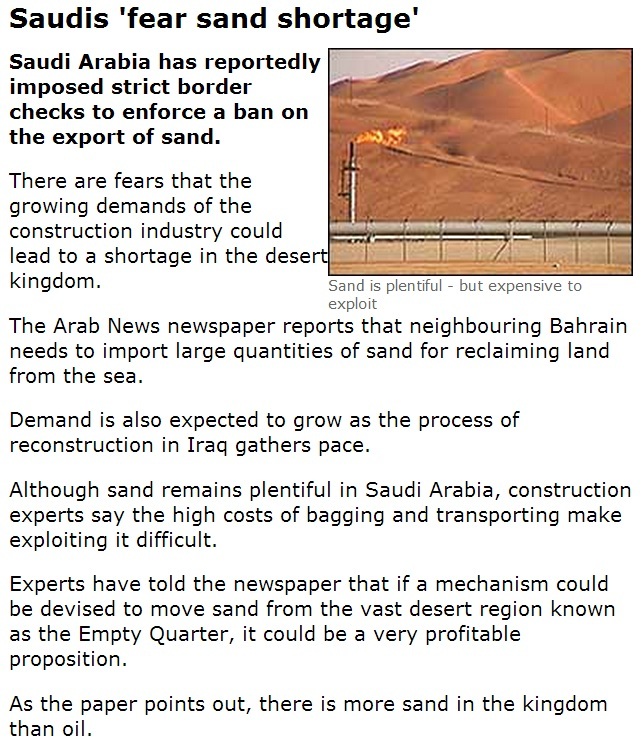 Saudi Arabia has reportedly imposed strict border checks to enforce a ban on the export of sand. 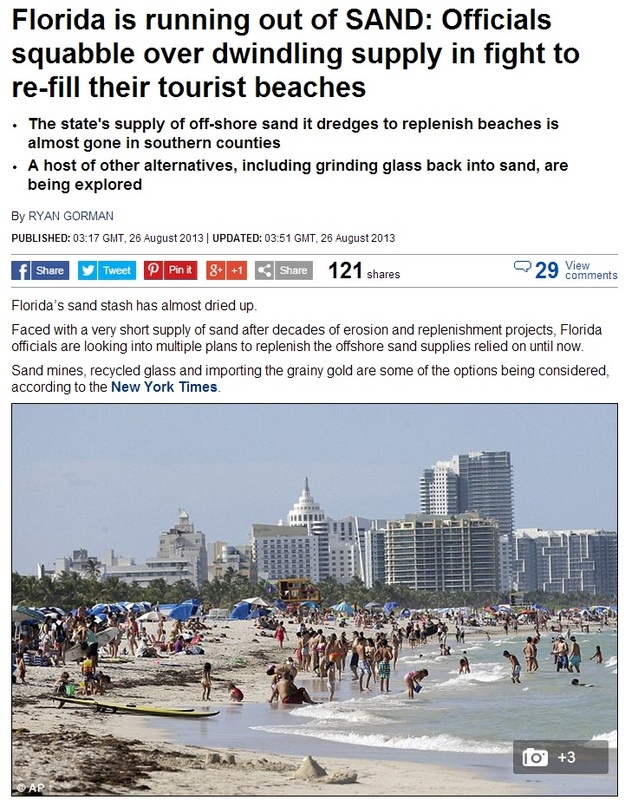 Florida’s sand stash has almost dried up. Faced with a very short supply of sand after decades of erosion and replenishment projects, Florida officials are looking into multiple plans to replenish the offshore sand supplies relied on until now. Where do all the sand come from? 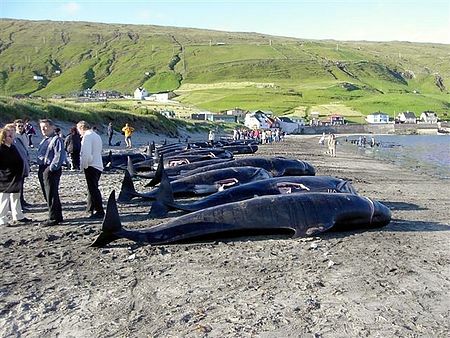 There is so much talk about the whaling.. The Sand Wars by Denis Delestrec : Everyone mourns the whales. But no one mourns the disappearance of sand. Image from Wikipedia. or the disappearance of bees and snow leopards. There is also much concern about taps running dry..
and the end of oil..and rightly so..
but how come there’s not much talk about the end of sand ? It’s easy to take for granted that which lies beneath our feet. Why, we’re walking all over it. And more islands may disappear.. Sand mining is washing away our shorelines. Not only that, it also has a negative impact on our biodiversity. 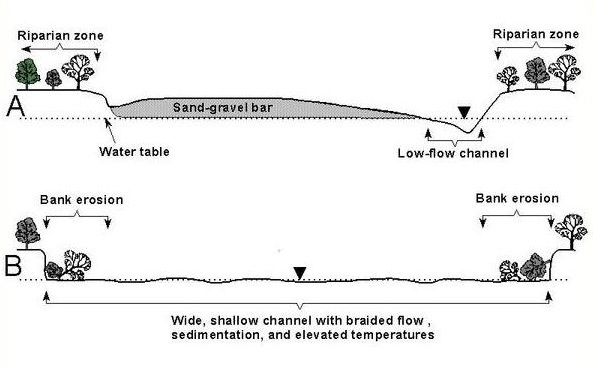 Here is the a table showing how sand mining impacts us in different ways. Fact : Sand mining is regulated by law in many places, but is still often done illegally. Singapore is expanding – at the expense of other countries. Singapore, one of the world’s most prosperous and fastest growing economies, is being accused of expanding its coastline with illegally dredged sand from neighboring states. Singapore has been importing sand for years and its territory has increased by over 20% in the last half century, but sand imports are now threatening the regional ecosystem and harming its economy. UAE is also notorious for importing sand, sand dredged from the sea floor. 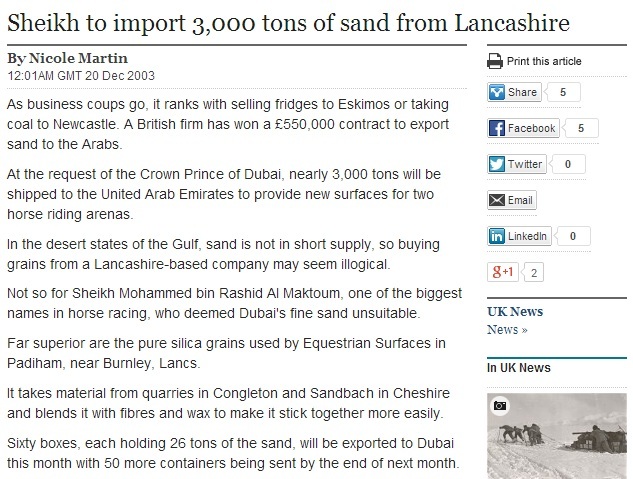 Indeed, selling sand to the Arabs is now a reality. But why can’t they use their own desert sand? Answer : Desert sands are too smooth. They don’t stick together. If sand particles, known as grains, are very smooth, their surface chemistry would not be able to offer sufficient number of multidirectional chemical linkages. 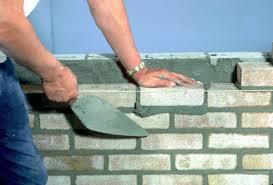 Their size is small, the slurry would slip and the concrete would have poor strength. Where as ordinary constructional sand meets the required specificiations of size and surface character, desert sand does not. Desert sand grains are very fine-far less sized-and have smoother, nearly spherical-surfaces, owing to extended drought, dryness, hot conditions and mutual rubbings due to own and wind currends besides other drastic conditions. Source : Google Groups Forum. Mumbai: At a time when the planet’s reserve of sand from its beaches is threatened by smuggling and illegal mining, environmentalists are asking India, as the present international custodian of the Convention of Biological Diversity (CBD), to take a lead in the control of sand mining. In their letter, they have pointed, “India [in spite of the Coastal Regulation Zone (CRZ) notification which bans sand mining in CRZ areas including in creeks and on beaches] continues to suffer the adverse effects on biodiversity of illegal sand mining, which is threatening the very existence of beaches and creeks. It is not only an environmental and geo-political issue, now it is also a socio-economic issue. It affects families, villages and communities. Two killed for leaking sand smuggling informationTwo men who passed information about sand smuggling to the police and revenue officials were attacked with sickles and iron rods and brutally murdered by a group of smugglers at Avoor village in Pudukottai on Friday night. The victims were identified as D Karthick (31), a lorry driver, and his bother D Rajesh (25) of Sengalakudi near Avoor. Now sand mining is taking its toll everywhere..
Construction company JT Ross has built its Riverside Business Park in Durban with rock gouged out illegally from a mountainside in the scenic Inanda valley. The eyesore sits adjacent to a hiking trail centre that the eThekwini Metro is building to pull day-tourists back to this impoverished area on the northern banks of Inanda Dam. It is the first leg of a bigger plan to create a “green corridor” along the Umgeni River. 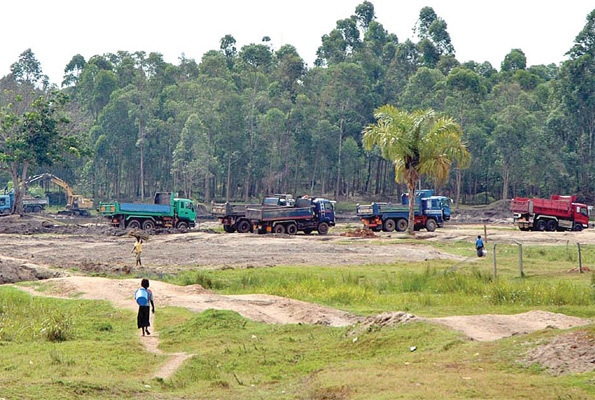 Environmentalists have raised the red flag on the continuous sand mining at Kyewaga central forest reserve near Kitinda Resort Beach located 10 kilometres off Entebbe Road in Wakiso District. The environmentalists warn that if nothing is done, the about 2009-hectare forest reserve may go extinct in a few years to come if nobody intervenes to halt the sand mining taking place in the area. Every time we take sand from somewhere, nature will find ways to recuperate the sand it lost. Nature does this by eating up the shorelines, banks and even islands. Illegal sand mining is not foreign to the Philippines either. GONZAGA, Philippines— At first glance, the processing plants that dot coastal communities in Cagayan province show no sign of activity, backing local officials’ claim that black sand mining has stopped. But as night falls, residents are roused from their sleep as heavy machinery starts running, and Dugo-San Vicente Road becomes busy with dump trucks bringing processed magnetite to Port Irene inside the Cagayan Special Economic Zone and Freeport in Sta. Ana town. “Many people here, especially those living on the roadsides, have been deprived of sleep because the dump trucks, about 200 of them, run at night,” said antimining advocate Esperlita Garcia. Mining companies were using this new tack to evade detection by law enforcement agencies, mainly the National Bureau of Investigation, she said. This is when you realize we are more connected than we [like to] believe. UAE’s and Singapore’s rapid expansions come with a price. The question is, who wants to pay for it? Some beaches around the world are now undergoing “beach nourishment“- that is, replenishing eroding beaches with sand. However, it is not a long term solution. Other people suggest “recycling” the pulverized glass bottles by returning them to the sea. Faced with the constant erosion of Florida’s beaches, Broward County officials are exploring using recycled glass — crushed into tiny grains and mixed with regular sand — to help fill gaps. 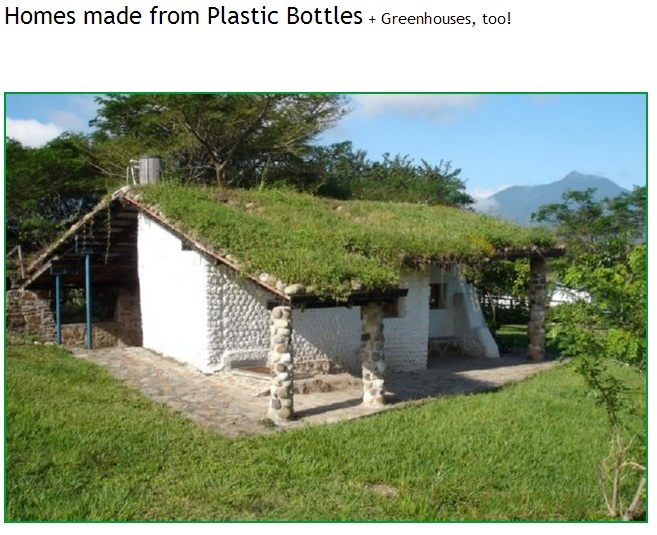 Others suggest changing the way we construct our houses, such as using straw to build our houses. Let’s keep ourselves informed. It can cost us much more than the beach we relax on. After all, don’t you agree that sand deserves much more respect than it is getting? Toss a grain of sand into the ocean, and you change the course of the universe. I had not thought about sand as a vital and scarce resource, but I can see clearly now that it is. 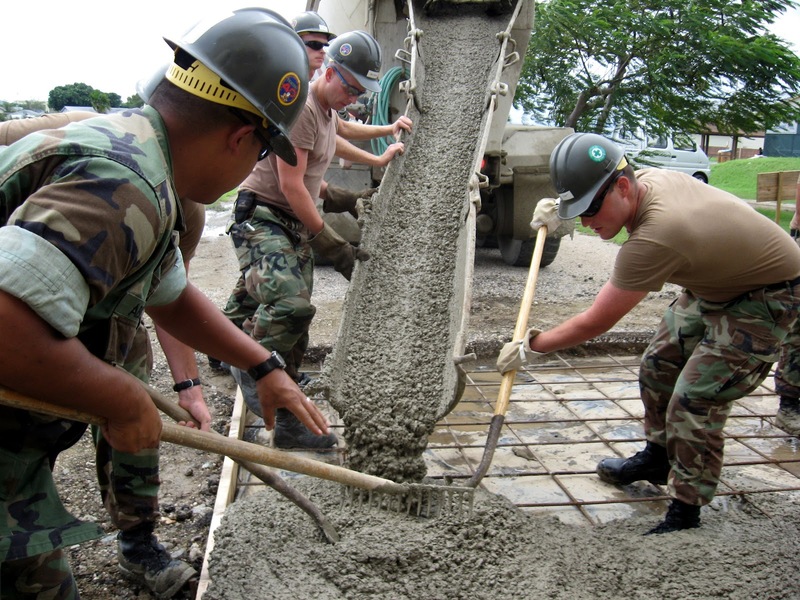 I always wondered about cement, when are we going to run out of that? Or the iron that goes into the steel that makes the bars that goes into the cement that holds the house together in the blast of typhoons. 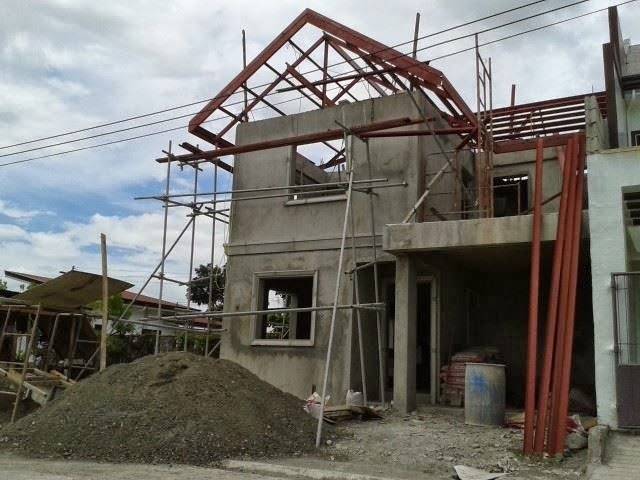 I’m also aware that some sands are better than other at adhering to cement, thus Ormoc, Leyte, is the sand capital of our region for its sticky grey volcanic sand. It’s probably running out, too. Back to the caves . . .
That was my first thought too.. And there I was thinking sand will last us for several lifetimes more. It amazes me how people can focus only what’s good temporarily, as if they have some other planet to escape to when mother nature comes back with a vengeance. In times like this, we are more intertwined than we like to believe, and we don’t know where each one’s actions (or when) they are going to be felt. Natural disasters don’t discriminate against anyone -aren’t these people the least bit worried? 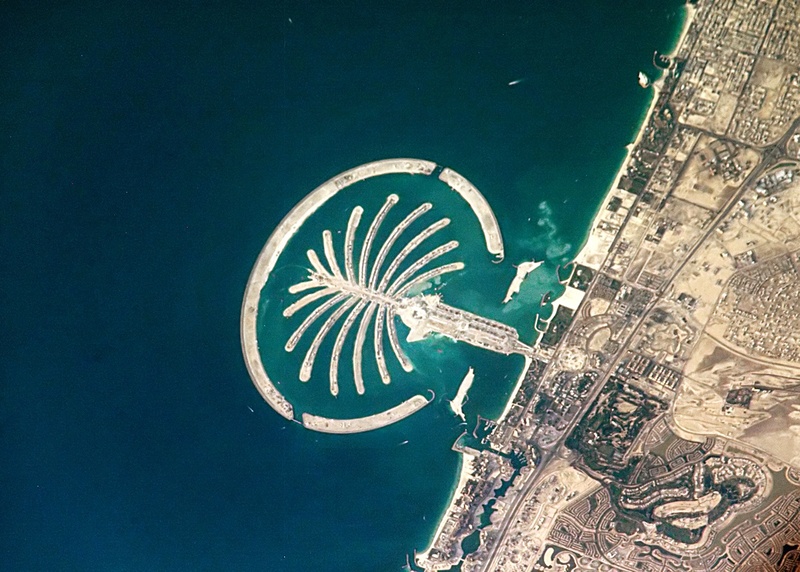 This entry was posted on April 8, 2014 by ikalwewe in For real?, politics and tagged beach, denis delestrec, dredging, dubai, illegal, india, mafia, mining, palm islands, sand, shortages, singapore, smuggling, uae, wars.